It has taken some time, but Windows Phone slowly gets the apps that users really want. 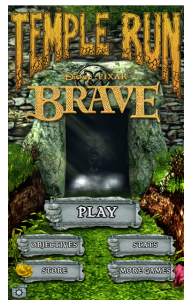 The latest arrival is Temple Run Brave, which plays off of the Pixar Animation Studios movie that was released through Disney. It is the first of two themed Temple Run games, with Oz later making its way to the mobile gaming platform, though not yet to Microsoft's mobile OS. Microsoft's Michael Stroh tells us "in Temple Run: Brave, you play Merida, heroine of the Disney/Pixar movie, as she races, slides, jumps, turns and shoots across Scotland’s backcountry wilds -- all in gorgeous visuals inspired by the film". Brave, one of four Temple Run games released to date, is similar to Pitfall, a game that many of us grew up playing on old Atari 2600 consoles, back in the day. However, this iteration of Imangi Studios’ original Temple Run also introduces archery. Customers just tap a target to aim and fire, and earn extra coins with every bulls-eye. The game runs a non-wallet threatening $0.99 in the Windows Phone store. The download is 31 megabytes and is at version 1.0. It does require you to be running version 8.0 of the mobile platform.